Need a Taxi in Chester or an Airport Transfer? 86 Stanley Park Drive, Chester, Cheshire CH4 8PQ. 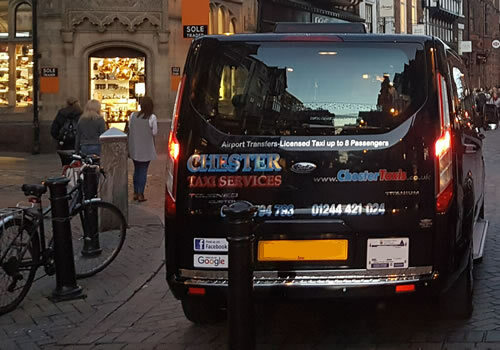 Chester Taxis provide a wide range of transport services to and from Chester. We have taxis to suit almost every need from taxi cars, black cabs, minibus taxis and even wheelchair friendly taxi options. We're proud of our minibus taxis which can seat up to 8 people in comfort. This makes journeys to Liverpool Airport and Manchester Airport a breeze with plenty of space for your luggage too! We even have wheelchair friendly taxis and our driver will be there to assist you if needed. For when you need a professional chauffeur service around Chester, our Mercedes-Benz E-Class will be there to provide you with a luxury chauffeur service. We have a range of exceptional minibus taxis to meet your every need. Our minibus taxis start at 5 seaters and go up to 8 seaters which are also wheelchair friendly. Our minibus taxis are ideal for airport transfers.